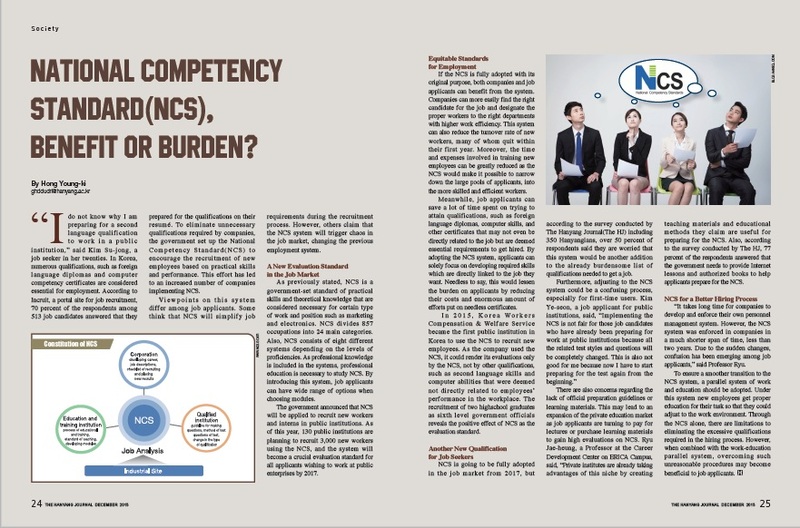 National Competency Standard(NCS), Benefit or Burden? “I do not know why I am preparing for a second language qualification to work in a public institution,” said Kim Su-jong, a job seeker in her twenties. In Korea, numerous qualifications, such as foreign language diplomas and computer competency certificates are considered essential for employment. According to Incruit, a portal site for job recruitment, 70 percent of the respondents among 513 job candidates answered that they prepared for the qualifications on their resumé. To eliminate unnecessary qualifications required by companies, the government set up the National Competency Standard(NCS) to encourage the recruitment of new employees based on practical skills and performance. This effort has led to an increased number of companies implementing NCS. View points on this system differ among job applicants. Some think that NCS will simplify job requirements during the recruitment process. However, others claim that the NCS system will trigger chaos in the job market, changing the previous employment system. As previously stated, NCS is a government-set standard of practical skills and theoretical knowledge that are considered necessary for certain type of work and position such as marketing and electronics. NCS divides 857 occupations into 24 main categories. 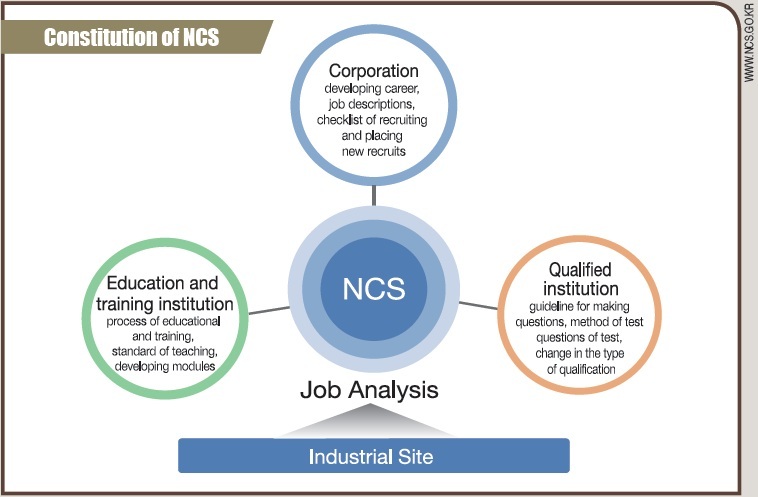 Also, NCS consists of eight different systems depending on the levels of proficiencies. As professional knowledge is included in the systems, professional education is necessary to study NCS. By introducing this system, job applicants can have wide range of options when choosing modules. The government announced that NCS will be applied to recruit new workers and interns in public institutions. As of this year, 130 public institutions are planning to recruit 3,000 new workers using the NCS, and the system will become a crucial evaluation standard for all applicants wishing to work at public enterprises by 2017. If the NCS is fully adopted with its original purpose, both companies and job applicants can benefit from the system. Companies can more easily find the right candidate for the job and designate the proper workers to the right departments with higher work efficiency. This system can also reduce the turnover rate of new workers, many of whom quit within their first year. Moreover, the time and expenses involved in training new employees can be greatly reduced as the NCS would make it possible to narrow down the large pools of applicants, into the more skilled and efficient workers. Meanwhile, job applicants can save a lot of time spent on trying to attain qualifications, such as foreign language diplomas, computer skills, and other certificates that may not even be directly related to the job but are deemed essential requirements to get hired. By adopting the NCS system, applicants can solely focus on developing required skills which are directly linked to the job they want. Needless to say, this would lessen the burden on applicants by reducing their costs and enormous amount of efforts put on needless certificates. In 2015, Korea Workers Compensation & Welfare Service became the first public institution in Korea to use the NCS to recruit new employees. As the company used the NCS, it could render its evaluations only by the NCS, not by other qualifications, such as second language skills and computer abilities that were deemed not directly related to employees’ performance in the workplace. The recruitment of two highschool graduates as sixth level government officials reveals the positive effect of NCS as the evaluation standard. NCS is going to be fully adopted in the job market from 2017, but according to the survey conducted by The Hanyang Journal(The HJ) including 350 Hanyangians, over 50 percent of respondents said they are worried that this system would be another addition to the already burdensome list of qualifications needed to get a job. Furthermore, adjusting to the NCS system could be a confusing process, especially for first-time users. Kim Ye-seon, a job applicant for public institutions, said, “Implementing the NCS is not fair for those job candidates who have already been preparing for work at public institutions because all the related test styles and questions will be completely changed. This is also not good for me because now I have to start preparing for the test again from the beginning.” There are also concerns regarding the lack of official preparation guidelines or learning materials. This may lead to an expansion of the private education market as job applicants are turning to pay for lectures or purchase learning materials to gain high evaluations on NCS. Ryu Jae-heung, a Professor at the Career Development Center on ERICA Campus, said, “Private institutes are already taking advantages of this niche by creating teaching materials and educational methods they claim are useful for preparing for the NCS. Also, according to the survey conducted by The HJ, 77 percent of the respondents answered that the government needs to provide Internet lessons and authorized books to help applicants prepare for the NCS. “It takes long time for companies to develop and enforce their own personnel management system. However, the NCS system was enforced in companies in a much shorter span of time, less than two years. Due to the sudden changes, confusion has been emerging among job applicants,” said Professor Ryu. To ensure a smoother transition to the NCS system, a parallel system of work and education should be adopted. Under this system new employees get proper education for their task so that they could adjust to the work environment. Through the NCS alone, there are limitations to eliminating the excessive qualifications required in the hiring process. However, when combined with the work-education parallel system, overcoming such unreasonable procedures may become beneficial to job applicants.